If you’ve heard of high-fidelity audio or already own a top-quality system or equipment, then you know just how transformative this technology can be. There’s nothing quite like listening to your favorite tunes or jamming to a new hit record on high-performance speakers. Listening to music can be more than just a background activity. It can be a complete, immersive experience! But if you’re listening to your music within the common gathering areas of your house, it can be hard to listen without interruptions or noisy distractions. You also aren’t able to capitalize on the entire acoustic experience. If you want to feature the best high-end audio experience at your home in the Manhattan Beach, CA area, we recommend adding a dedicated listening room. Keep reading below to find out more about this auditory setup. What Difference Does a Listening Room Make? Being able to listen to your music the way the recording artist or music producer intended you to is essential. But with other people in your home, there are bound to be disruptions – or you might find yourself having to lower your volume so that it doesn’t disrupt anyone either. This can hinder your entire listening experience. A dedicated listening room gives you a space of your own that is designed specifically for you to enjoy your music. Use the room to take a break, to relax in, or to find creative inspiration. With acoustic wall treatments in addition to your high-performance audio equipment, you can create the perfect music-listening environment within your house. If you want to genuinely immerse yourself in your favorite music – to feel the bass of the track and the intricacies of each instrument – the best way to accomplish this is in a dedicated, closed-door setting. Which Room Will You Use? You might have a variety of rooms or areas in your home that would be great for a listening room. If you have an open floor plan, it can get a bit trickier. You need a closed-off space that keeps your music contained and lets it totally immerse and envelop you in unparalleled sound. But not just any space will do. For instance, an unfinished basement or garage might be far enough away from everywhere else in your house. However, concrete or cinder block walls can make for bad acoustics – and without the proper temperature and climate controls, you can damage your high-end audio equipment’s performance. An extra bedroom, for example, is a prime option. You can make a checklist when thinking of a room to use: Ensure it has at least four walls, a door that closes, is a climate-controlled space and has enough room for all your equipment. 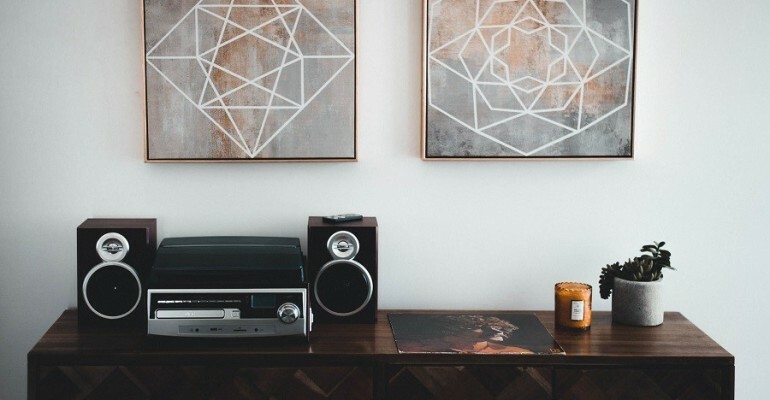 Once you’ve chosen your room, it’s time to bring in your high-end audio equipment and install it properly. You’ll want to optimize your room’s sound and make sure every speaker is well-placed. If you have a two-channel stereo system, creating a sound triangle is key. You at the base and the speaker to your left and the one to your right should form an equilateral triangle – with the distance between each the same. This will deliver your audio directly to you at its highest performance. With your sound triangle in mind, you’ll also want to place your speakers at head level. This means you’ll need to determine where in the room you’ll be listening to your music. Is it in the comfy chair in the far corner? Or the rug on the floor? Once you’ve decided, you can figure out how low or high to place your equipment. And if you notice your room doesn’t quite have the acoustics you’re looking for, or maybe further testing has proved that some adjustments are needed – then you can bring in acoustic treatments and panels to make the necessary changes. Want to learn more about why a dedicated listening room can make all the difference for your high-end audio system? Give us a call or fill out our online contact form to schedule a no-obligation consultation with our team. We’d love to hear from you!